The city must stop hiding the ugly details of police misconduct behind the confidentiality agreements it requires of victims in return for monetary settlements. “We will not remain silent in return for hush money,” Holmes said, addressing a rally that drew community leaders and activists. “My voice is not for sale!” Ted Sutton, of Men Against Murder added, leading the crowd in chanting the refrain. Several speakers referenced the 2015 death of Freddie Gray after officers placed him in a police van in West Baltimore, sparking days of protests and a night of rioting. Others brought up the corruption exposed by the federal prosecution of officers in the elite Gun Trace Task Force. While the rally was taking place, police officials were disclosing at a City Council hearing that five additional officers were under internal investigation in connection with the GTTF. The officers were not identified by Deputy Commissioner Andre Bonaparte and his staff, mirroring the complaint of protesters that the department operates with little accountability. 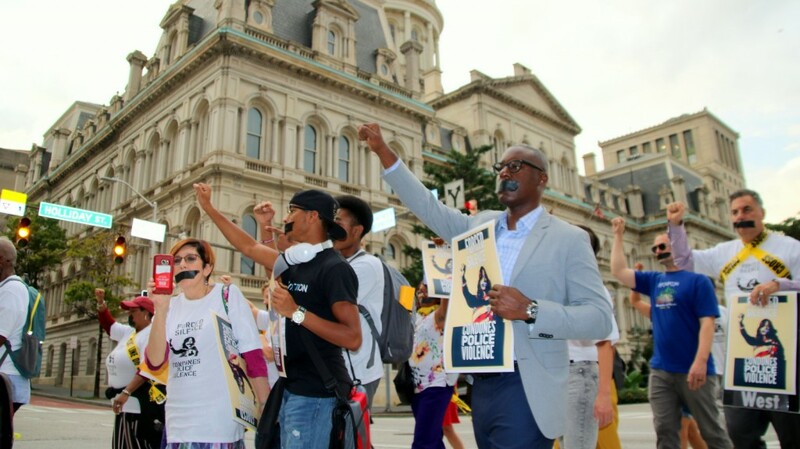 The rally was organized in parallel with a lawsuit seeking to end the gag orders that was filed in 2017 by the American Civil Liberties Union of Maryland on behalf of plaintiff Ashley Overbey and this website, Baltimore Brew. The suit, which is pending in the Fourth Circuit Court of Appeals, argues that the non-disclosure agreements the city typically requires of police misconduct victims are unconstitutional. They are also highly unusual, according to ACLU legal director Deborah Jeon. Speakers called for Mayor Catherine Pugh to end the practice and to declare all past gag orders in police abuse cases to be null and void. Tre Murphy, a field organizer for the ACLU of Maryland, read the full list of demands. The rules around disclosure of police abuse settlements, for which the city pays out millions annually, mean the public has few details about police misconduct, an issue that has dominated headlines for years. “I’ll support any legislation to end the gag order,” said Sen. Jill P. Carter, the only elected official to attend the rally. The rally started with a fiery address by Tawanda Jones, whose brother Tyrone West died while in police custody in 2013. 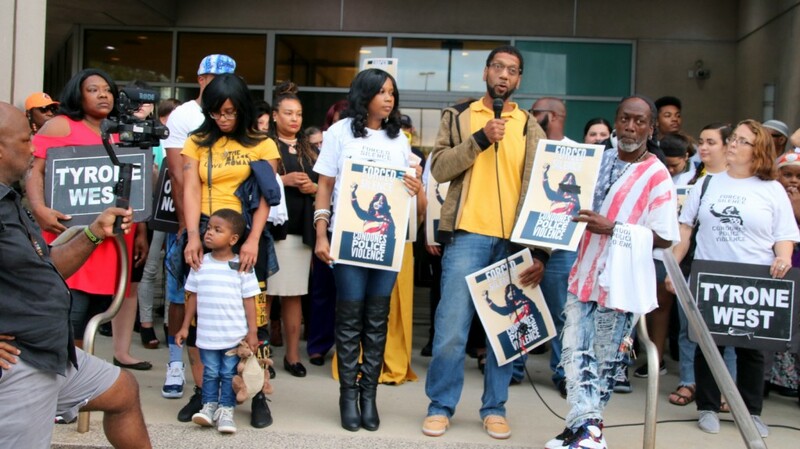 Jones refused to be part of a cash payment that other family members accepted after his death, preferring the freedom to speak out and call for the officers involved to be held accountable. 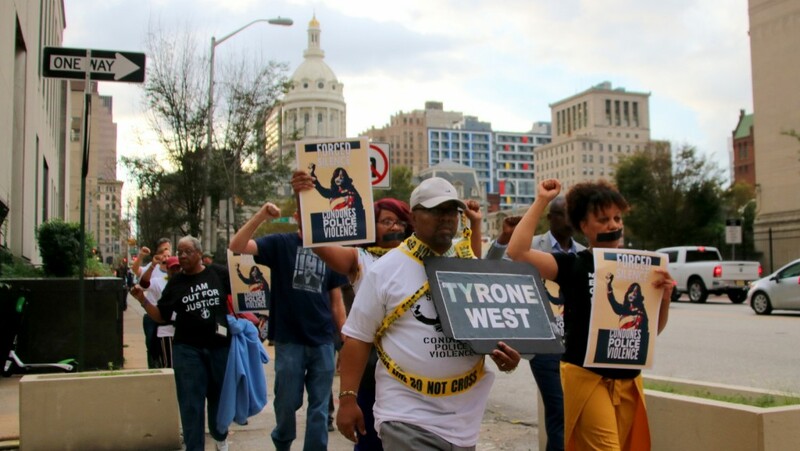 For 272 weeks, she has protested on the streets of Baltimore, bringing signs, supporters and a bullhorn to her weekly “West Wednesdays” rallies. “There is no deal when they kill your loved one, let’s be crystal-clear,” she said last night. 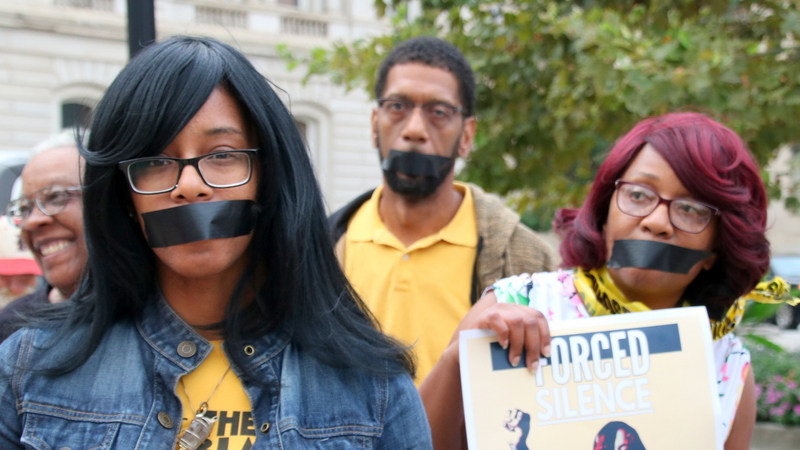 After the rally at City Hall, the group marched along Fayette Street to police headquarters, mouths sealed with black plastic tape. 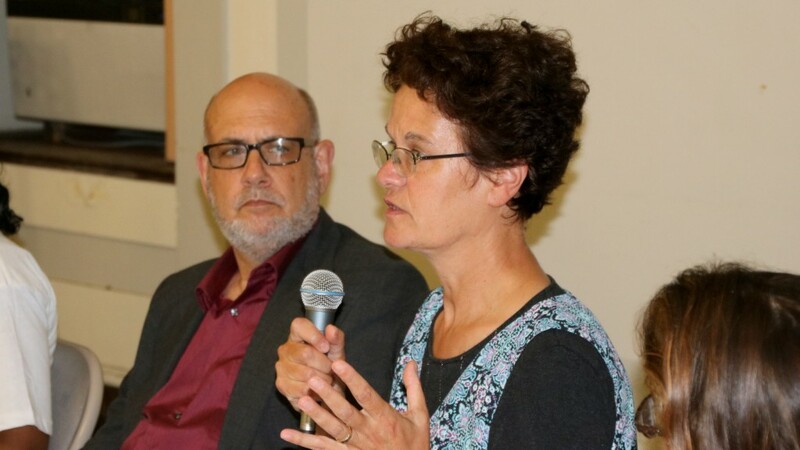 Gretchen Tome, a clinical social worker, said it is important for those traumatized by violence, including police violence, to be able to tell their stories. 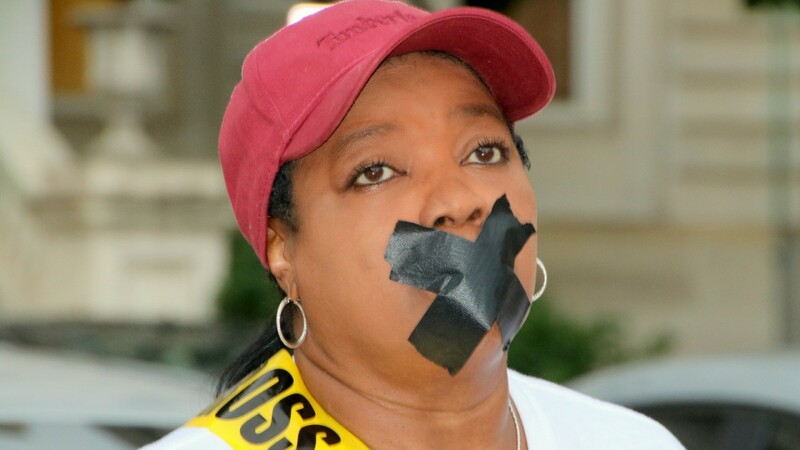 Ending the use of gag orders “is a way to let the people speak and let our city heal,” said Tome, of Runners4Justice. 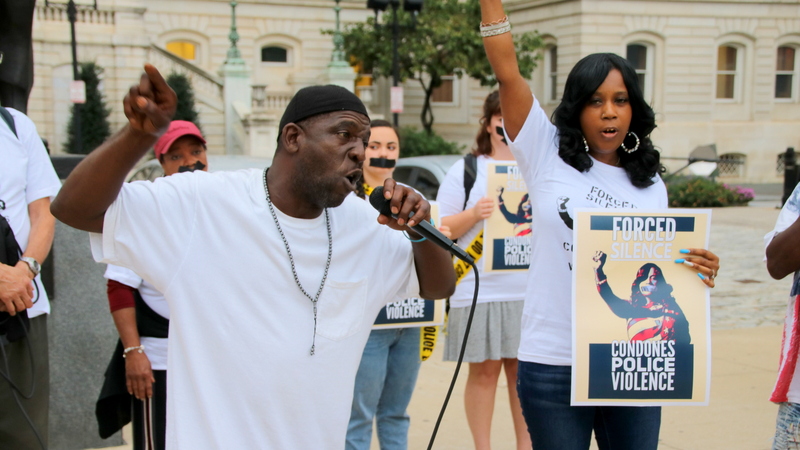 How to convince city leaders of the importance of truth-telling about police misconduct? At a forum in the War Memorial Building after the march, the suggestions ranged from protests outside the Exelon Building to shutting down the legislature. City leaders will only act, several said, if they detect a strong public demand for more transparency. “It’s extremely important to tell these stories,” Brew reporter Mark Reutter said. “And you have to be able to give the storytellers – the media – the right to tell them.